OSUIT students getting hands on training. Photo by Cacey Cottom, OSUIT. Vocational and trade schools, and technical schools as well, are becoming more and more popular. Today, the Oklahoma Department of Career and Technical Education reports that career and technology education in Oklahoma is offered in grades six through 12 in more than 540 comprehensive schools and on 58 campuses of the 29 technology center districts. And in addition to these numbers, the rate of students choosing trade schools over traditional four-year colleges is increasing. But why? Teachers at trade schools in Oklahoma say there are many benefits. [pullquote]Often trade and technical training colleges have been viewed as a downgrade in education, but in reality, they are not higher or lower to a more traditional college – just different,”[/pullquote]McCullough, a dean for the School of Visual Communications at OSUIT, says he thinks trade and technical schools are becoming more popular because it’s easier to find job opportunities with these degrees in the current (and future) economy. Trade schools fill that skills gap. The Oklahoma Department of Career and Technical Education says this type of education goes well beyond explaining how an industry works; the educational tracks include the immersion of students in real-world simulation and on-the-job training for a specific job – not just a field. Haynes also adds that he believes trade schools are increasing in popularity because of the high costs of four-year colleges. “When a student leaves a higher education program, they will typically have incurred debt. The sooner you can translate that education into higher paying positions or upward mobility, the easier it is to pay off the debt and improve your life circumstances,” Haynes says. In the future, McCullough at OSUIT predicts that there will be even more direct industry involvement in trade school education. Haynes says he has seen a welcome uptick in female students – a trend that seems to be continuing upward. So how do you know if a trade school is right for you over a traditional four-year college degree? 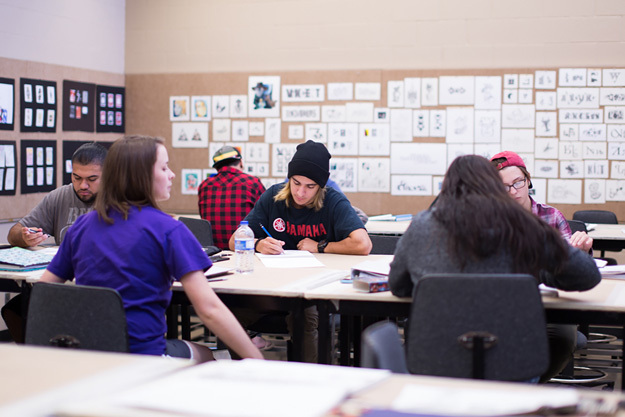 The Oklahoma Department of Career and Technical Education recommends that students consider academic interest and vocational goals, as well as students’ ability to learn by “doing” and the possibility of student debt from a traditional college. And Haynes at Spartan College wants to remind potential students that trade schools are by no means of lower rank.